Memory Lab is a collective project of the European Month of Photography network focused on questioning memory and reflecting history through art. The project, which includes series of exhibitions and a publication, is displayed independently and differently in each member city. In Ljubljana the exhibition showcases works of five artists whose main focus is to explore the perception of recent and historical conflicts that still resonate in current public discourse. The exhibiting artists are generally concerned with recalling the painful events and aftermaths of the major European conflicts that marked the 20th and 21st century, from World War II, wars in Yugoslavia to recent aggression in the Middle East. Each artist addresses issues of preserving memory as well as history writing deriving from it. Moreover, the artists often refuse to use photography as a means of documenting the world in a scientific or rational manner. Nevertheless, the desire to be a part of the unspoken and to play on the suggestive power of art remains, leaving it up to the viewer to bring their interpretation to the image. Tatiana Lecomte’s photographs exemplify a type of photography that no longer seeks to reveal, since too many things are beyond the image and the essence is frequently indescribable. Her series, entitled The Pond, emphasises haunting engagement with memory to the point where personal and political histories intersect. Noro Knap‘s film, entitled 20 April overlaps photographs of two events that took place in the identical place, and on the same day and hour 70 years apart, in 1941 and 2011. The past and present are also central themes of the Ghosts of the Past series of photographs by Darije Petković who conducted an exploration into the phenomena of memory and of rewriting history. The artist documented the so-called May celebrations, to which followers of past regimes and ideologies from the territories of former Yugoslavia converged yearly. With the Real Play Figures series Marko Lipuš exposed the absurdity and cruelty of modern wars. 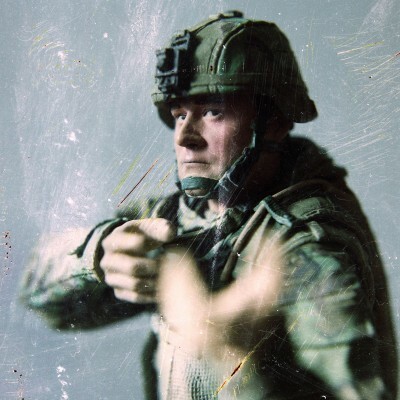 The viewer is confronted with portraits of soldiers based upon toy figurines, thus demystifying the role of a soldier in a postmodern society as depersonalised members of an imperial state. Attila Floszmann on the other hand placed the events of the civil war in Libya into an alternative visual context whereby the events of the Arab Spring appear as universal signs, moving beyond the current and topical. He documented the changes caused by armed conflict in the affected architecture and landscape in order to show the real nature of the war.